Plant a tree in memory of Robert Lee "Bobby"
Be the first to share your favorite memory, photo or story of Robert Lee "Bobby". This memorial page is dedicated for family, friends and future generations to celebrate the life of their loved one. 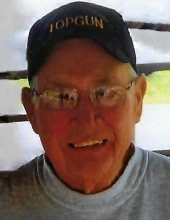 Mr. Robert Lee "Bobby" Watson of Greensburg, Kentucky, son of the late Lee Watson and Catherine Elizabeth Livers Watson, was born on Tuesday, October 25, 1938 in Lebanon, Kentucky and departed this life on Wednesday, March 28, 2018 at the Taylor Regional Hospital. He was 79 years, 5 months, and 3 days of age. He had made profession of faith in Christ and was a member of the Good Shepherd Catholic Church in Columbia. He was also a retired Aerial Observer for the Division of Forestry. Survived by his wife of 32 years, Sharon Gupton Watson of Greensburg, having united in marriage on August 24, 1985. Other survivors include a brother and sister-in-law: Ray and RosAnna Watson of Louisville; a sister: Brenda Penn of Georgetown; and a host of other relatives and friends. Mr. Watson was also preceded in death by a brother and sister: Joe Mattingly and Elizabeth Strange. The funeral services for Mr. Robert Lee "Bobby" Watson will be conducted at 2:00 P.M., Central Time, Saturday, March 31, 2018 at the Cowherd and Parrott Funeral Home with burial to follow in the Ebenezer Cemetery. Bro. Eudell Stilts officiating. Visitation is requested from 4:30 P.M. until 8 P.M., Central Time Friday at the Cowherd and Parrott Funeral Home and after 7 A.M., Saturday until time of the funeral service. Memorials are suggested to the Ebenezer Cemetery Fund or the WHAS Crusade for Children, which can be made at the funeral home. To plant a tree in memory of Robert Lee "Bobby" Watson, please visit our Tribute Store. "Email Address" would like to share the life celebration of Robert Lee "Bobby" Watson. Click on the "link" to go to share a favorite memory or leave a condolence message for the family.